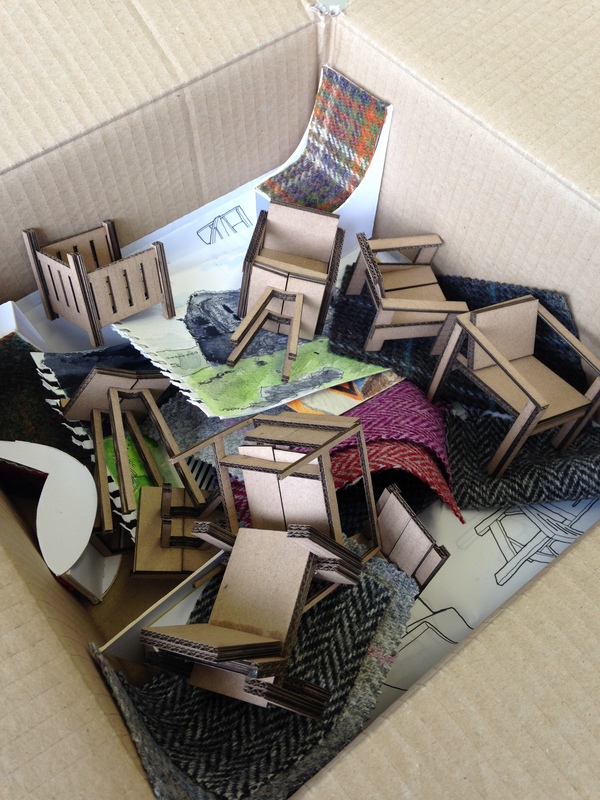 Today I went down to the workshop with all my sketches and models accumulated in one box of ideas and inspiration. I wanted to have a chat with Malcolm to figure what the next steps of my process should be. It was really useful having the sketches with me as I could use them as reference points when talking about the island. The models were also good as we could talk about what was working and what wasn’t. Again, Malcolm felt that the design of the chairs said nothing about the island – it was too uniform and looked more like modern Scandinavian design that you might see in an Ikea showroom, rather than bespoke pieces influenced by the island. If you put the models of the furniture next to the sketches of the island they do not look like they belong there – which they should. I guess I’ve been holding back in the design of my chairs after Chris and Graham suggested designing a chair inspired by the island might be too ambitious and I should keep it simple. But perhaps I need to be more brave and design something a bit more unique, taking inspiration from Harris Tweed and the island. Fortunately, some of my better designs have the potential to achieve this with just a little bit of tweaking. 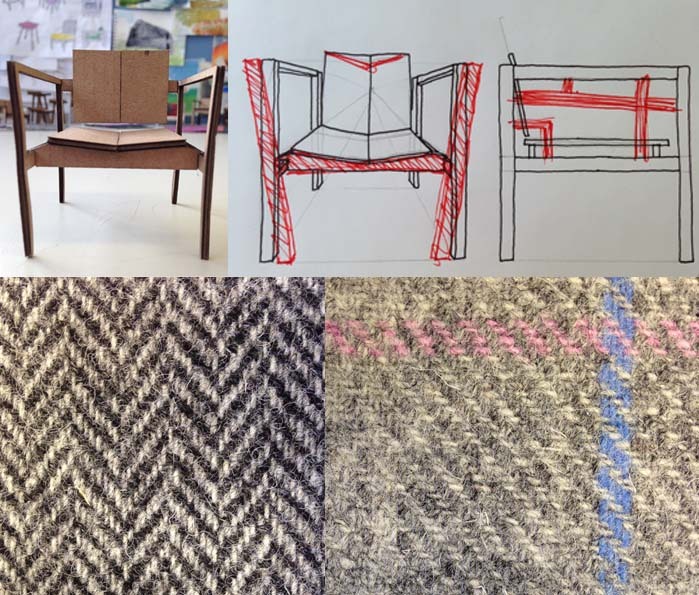 The slight v-shape on the chair below lends itself well to the traditional Herringbone pattern found in Harris Tweed. Maybe the legs could be manipulated into a slight v-shape to carry on this theme. Alternatively, the side of the chair is very rectangular – adding in seemingly random parallel/perpendicular lines of varying thicknesses could be a nod to some of the check patterns which would also break up the uniformity of the chair. Another idea would be to borrow some design aesthetics or structural elements from the man made elements that intervene with the land. Going back to the chair in the other examples, the support beams for the chair actually look not too different from the structural elements of a small fishing boat, which of course is fundamental part of the island culture. Malcolm thought that the chair below reminded him of a pier, as the extended front legs look like old wharfs. This has given me a whole new focus to look at. It would be interesting to look into more detail at the industries and livelihoods of the people of the island, such as weaving, crofting, fishing and more. If I can find out what defines them, I can incorporate these elements into my design. I think the next step should be to take a few of my ideas and develop them with all this in mind.